Wine lives and breathes, like a character in my life. Moscato d’ Asti is that beautiful, feminine, and delicate friend. The kind of friend that makes you wonder how she makes it look so effortless, yet, every time she manages to knock it out of the park. While you’re barely able to slip on your leggings and get out of the door, she shows up on time (or early! ), is as polished as ever, and smells like roses and sunshine. Every time I stick my nose in a glass of Moscato d’Asti, I get this feeling. It’s the smell of the most delicate perfume from an antique crystal container that you dab behind your ear. It instantly makes you feel like a lady. Now for some reason “moscato” is a bad word in the United States. Moscato is usually taken to be crappy and sweet and for those who know nothing about wine. For Moscato d’ Asti, this could not be further from the truth. It’s like judging Champagne based off a $4 bottle of Cook’s “Champagne”. 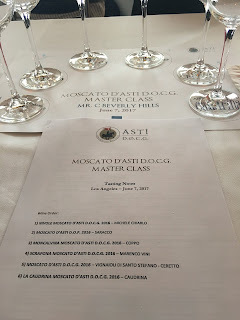 In June, I attended a Moscato d’Asti Masterclass at Mr. C’s in Beverly Hills. It was a top notch event with a panel moderated by Tim Gaiser, MS. The panel consisted of winery representatives (often family members) from 6 different Moscato d’ Asti wineries. The food spread (courtesy of Mr. C’s) was incredible, and the wines paired beautifully. Piemonte is a large region in northwest Italy. Asti is a town within Piemonte that is east of Barolo and Barbaresco on the hilly right bank of the Tanaro River. In Asti, the vines are found on terraced, steep hillsides at 200m-600m. The DOC was granted in 1967, with DOCG status granted in 1993. Grapes are hand harvested with maximum yields of 10hL/ha. And the good diurnal shift (meaning the high difference in daily temperature between the lowest and highest temps) gives floral aromas and good fruit/acid balance. In 2014 UNESCO declared the vineyard landscape of Piemonte, specifically the Lange-Roero and Monferrato, as a World Heritage Site. This was the first “terroir” to get this declaration. Champagne hillside, houses, and cellars were later declared in 2015. Moscato d’Asti is a slightly sparkling (aka frizzante) DOCG wine made in the province of Asti with the Moscato Bianco grape. It is low in alcohol, and generally sweet. The maximum ABV is 5.5%, meaning that the fermentation is stopped midway, leaving some natural, residual sweetness. In order to retain fresh primary fruit aromas and flavors, the grapes are pressed slowly and cold stored until fermentation. Fermentation is long and cool in closed stainless steel tanks, with the resulting carbon dioxide causing the slight effervescence. The wine is then bottled, with no second fermentation, as the natural bubbles still remain. 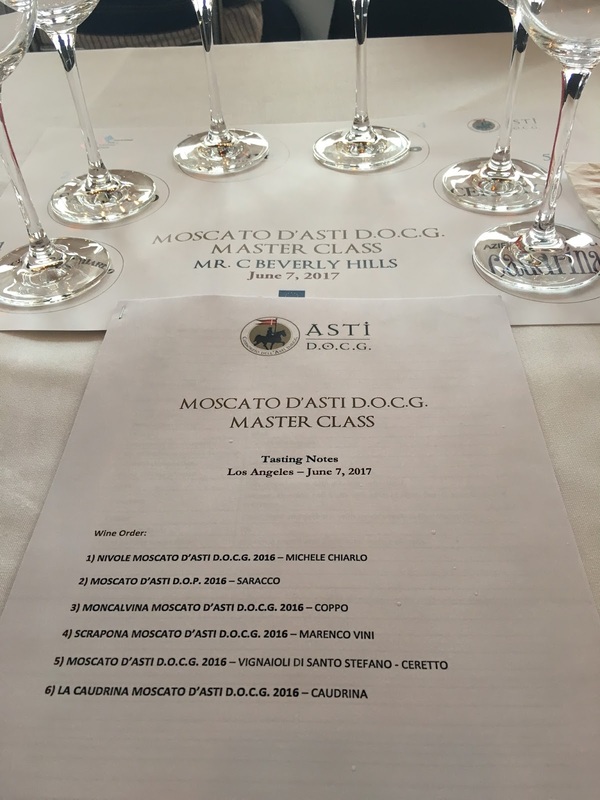 Moscato d’Asti is known for its refreshing acidity and its combination of both floral and stone fruit aromas and flavors. As expected, this is a very delicate and feminine wine with notes of sage, stone fruit (peach), citrus (grapefruit), and meringue. Michele Chiarelo produces over 250,000 cases annually. These vines are in Canelli, one of the most famous municipalities in Asti. This wine would be good as an aperitif with fresh strawberries or as a foil to spicy food. This wine is under screw cap, which is unusual for an Old World wine. Saracco produces 700,000 cases annually. I get peach, orange blossom, and thyme on this wine. Overall, a delicate aroma with a significant amount of floral on the palate. Luigi was our spokesperson here, and Coppo was founded by his great-grandpa in 1892. According to Luigi, the taste of the grape at harvest should be close to the taste of the finished wine. These vines are also in Canelli. This wine has a fresh, light nose with notes of floral plus pear and peach. The winery tasting notes say this wine would pair well with Robiola di Roccaverano (an old goat cheese typical of Piemonte), which sounds delightful! Marenco Vini produces 30,000 cases annually. It is a family winery with the 4th generation at the helm. The Scrapona vineyard is in Strevi. Some wines are under cork and some are under screw cap. They’d switch to screw cap tomorrow, but the Italian consumer has not been as quick to embrace the screw cap. This wine is estate bottled and gives citrus, lime, passion fruit, and orange blossom. Plus an earthy savory nose reminiscent of forest floor. They store the grape juice in tank and do multiple fermentations per year, so as to bottle the wines fresh and to preserve the fruit and floral notes. This wine had a brighter yellow color than the others. Pronounced rose petals and ginger spice on the nose. The palate is full of elderflower, lime, and peach. The winery produces 260,000 cases annually and has been harvesting earlier due to climate change, as their grapes tend to reach phenolic ripeness earlier. Caudrina produces 120,000 cases annually. It is a family owned winery started in the 1940s wih vineyards in Castiglione Tinella. This wine has a lovely citrus note (clementine or orange blossom) with an oily, full body. Thank you to IEEM-USA for my invite to this event! Cheers.